Straight from the Dogg Pound comes a mediocre horror anthology with an urban twist. In “Crossed Out,” a local witch doctor – for reasons unclear – blesses an orphan with the ability to kill vandals by spray-painting a big red X over their tags. It’s more of a sequence than a story – reminiscent of a music video in its frenetic energy, impatience with plot or character, and straight-to-video special effects. It’s probably the most clever of the three tales, though it’s also the most brutal. And by brutal I mean not only blood but in the vicious way a female is treated and referred to. I suppose you could argue that she deserved it. But in all three of these stories, the “b-word” is thrown around just a little too lightly for my tastes – but you know, what does that really matter in the same film where beer bottles penetrate brains and puppies are capped into pulp? “The Scumlord” could’ve been ripped straight from the annals of Tales From the Crypt with its goofy humor, caricature and exaggeration. Tex Woods Jr. (there’s a redneck name for you) is a good ‘ol southern boy who’s been bequethed his father’s estate – on condition he learn a little tolerance by bunking up with his dad’s four black war-buddies. Can’t we all just get along? He sure can’t. These old men show an amazing tolerance for Tex’s racist shenanigans before they reach their inevitable breaking point. “Rhapsody Askew” is maybe the most uneven of the three. A boy prays to God to let him become a famous rapper, and the moment his prayer is answered he gets a big head and makes life a living hell for everyone around him – including the partner who boosted him to the top. I see an allegory here to the hip-hop culture of respect and props – a morality tale reinforcing your debt to those who helped make you who you are. I thought it was a little cheesy and predictable in the end. A stylized animated sequence weaves the three tales together. I suppose it’s implying the stories are coming from a non-existant comic book, ala Creepshow or Tales from the Crypt, though it’s more anime than EC. Honestly, I couldn’t really understand it, aside from the fact that Snoop Dogg appears to be either Satan or a Cryptkeeper figure who is teaching his diminutive demon friend how to steal souls. 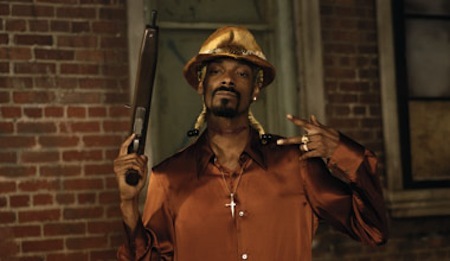 Aside from the Doggfather himself, you’ll be surprised at the familiar faces that pop up throughout the tales. We have Danny Trejo’s scarred face, Billie Dee Williams, Ghostbuster Ernie Hudson, Jason Alexander with a British accent, and the unfortunately named Tucker Smallwood. I’m sure there are others I’d recognize if I hung in the right circles. The rap world is tight-knit, and figures big and small frequently guest-star in each others’ projects – musical or otherwise. I’ve always admired that. If you’re itching for a horror anthology with an inner-city sensibility, I recommend you instead check out the far superior Tales From The Hood by Rusty Cundieff. And when you’re done with that, check out his tragically overlooked and forgotten Fear of a Black Hat – the definitive (and hilarious) Spinal Tap for the rap fans. I wish that guy were still making movies. Snoop Lion can step away for a while.